There are other of his poems that I like equally well; I had a hard time limiting myself to just one. But then, I love Rilke. 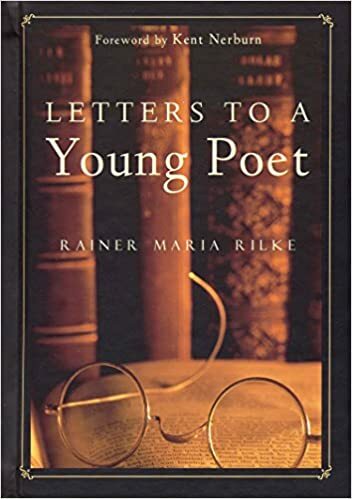 Especially his book Letters to a Young Poet. It's one of my favorite reads; one those timeless books that I find myself returning to year after year. And it never gets old. At least not for me. But then, like I said, I love Rilke. Esther's hand raced over the paper as if the colored pencils might be snatched from her, the quivering inside her wild, foreign, thrilling. All this time she hadn't known that "blue" was actually seven distinct shades, each with its own name--azure, Prussian, cobalt, cerulean, sapphire, indigo, lapis. 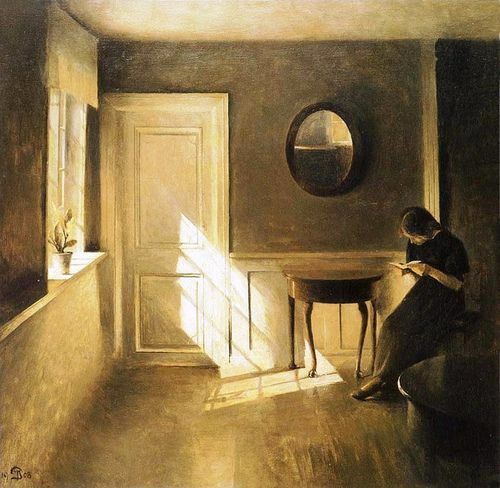 She pressed the waxy pencils on the paper, amazed by the emerging hues....In this stolen hour at Mademoiselle Thibaux's dining-room table, she could draw without being scolded for committing the sin of idleness, God forbid. 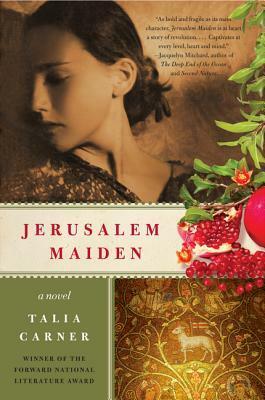 Talia Carner's Jerusalem Maiden immerses the reader in the world of the Haredi, a community of ultra-orthodox Jews, at the turn of the 20th century when the Ottoman Empire is coming to an end. At the heart of the novel is Esther Kaminsky, a young girl who finds herself torn between her passion for art and her desire to please God. She feels her talent for creating beautiful sketches and oil paintings must come from God, but according to her strict culture there are no Jewish artists, drawing portraits is especially forbidden, and "marriage is the greatest destiny for girls". Esther struggles to accept her destiny without giving up her own desires and dreams. But she can't choose her art without betraying both her family and her God. She is trapped by her birth. And I really felt for her. I found this book fascinating, especially learning more about the Haredi culture; I couldn't believe the strictures placed on women in this very narrow and pious community. It was pretty eye-opening, and also frustrating and a bit maddening. (And it made me very glad Esther's life isn't mine!) Still, to be able to visit not only Jerusalem, but also Paris in the early 1900s, made for an amazing bookish journey. Both places are always so interesting and fun to read about. As for Esther, her story is moving and poignant and ultimately bittersweet. 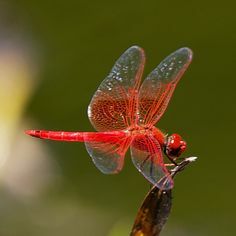 I cheered for her, cried for her, and wished I could change her world for her...or that she would do something amazing and brave and change it herself. But not all books have happy endings. I can't say I loved this book, but it was an interesting read and Esther is one of those characters I won't soon forget. Probably because I felt so bad for her most of the time. Death was not unfamiliar to me. I had seen more than my fair share of corpses in my lifetime, and I had been quite happy to escape them for the last sixteen months. 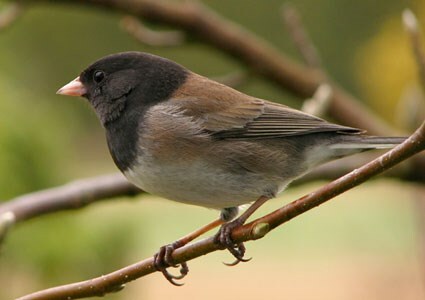 So I hardly relished the appearance of yet another one, and in my sister's garden no less. I shivered, feeling the fear and shadows stir inside me I had worked so hard to lay to rest since my husband's death. I had never been very successful at the art of flirtation. I knew my sister was quite capable, having listened to her and Philip verbally banter with one another daily for over a year. My brother Trevor also seemed competent in the arena, if the number of young ladies in London angling for a marriage proposal from him were any indication. I, on the other hand, seemed to be missing that mysterious skill. It didn't matter what Gage believed. I knew that I was innocent, and so did my sister and brother-in-law. All I could do was focus on what I had set out to do in the first place--protect my sister and her family by finding the real killer--and in the process, prove my innocence, perhaps once and for all. Several hours in my studio did much to soothe my tattered nerves worn raw by the events of the last sixteen hours. The familiar roughness of the charcoal in my hand as I sketched the outline of a new portrait comforted me. Its musk of earth and ashes permeated the air, clearing away the lingering memory of blood and death. I lost myself in the sweep of lines, forgetting time and place. I had always known that I was a solitary person. Even when wed to Sir Anthony, even while living with my sister and her family, I knew the truth. I was alone. And likely would always be. 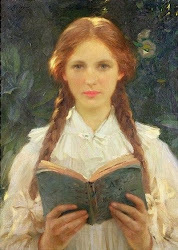 That normally did not trouble me, but lately I had begun to feel the weight of such a truth, the isolation of such a life, and it upset me more than I would have liked to admit. But I didn't know how to change that. My temperament, my talent, seemed to naturally hold me apart from others. The scandal had only exacerbated the problem. to a world we cannot enter in any other way." I checked this book out because of the title. 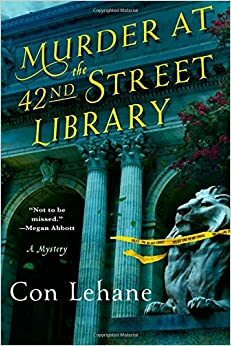 I just couldn't resist a murder mystery set at the 42nd Street library in New York City. (Which is a research library, not a circulating one.) The main character, Raymond Ambler, curates the library's crime fiction collection; he's also a "doggedly curious fellow" and an amateur sleuth. So when a writer is murdered at the library, Ambler can't resist poking his nose into the matter. What he uncovers is past scandals and old rivalries, professional jealousy, greed, unexpected connections, murderous secrets and a growing list of suspects. 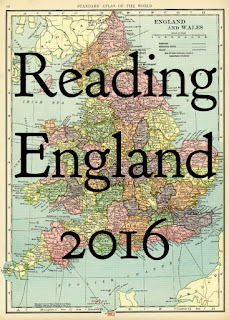 Who knew the bookish world could be so dangerous? What can I say? With a plot that includes two murdered writers, some clever librarians, one dedicated homicide detective, a couple of runaways, an all-knowing Irish bartender and a few surprises along the way, this is a winning mystery. I really liked Ambler and his fellow librarian and friend, Adele; they're both fun, engaging characters. The dialogue is great. And I loved the setting. This was a very entertaining find from the L shelf. I can't wait to read Lehane's next Raymond Ambler mystery. P.S. If you do read this book, ignore the sentences that didn't make sense because they were missing a word, or had an extra word that didn't belong, or even had the wrong verb tense. Unfortunately, I noticed several mistakes like that as I read this book. Makes you really miss the days of editors. "I hadn't been ruined by the world yet. I was pure. Untouched....And I was all his. A girl who would never say no. I was the girl who obeyed his every request. I was his perfect, obedient baby doll." Lily Riser and her identical twin sister, Abby, are inseparable. Even when they argue, which is quite often, they always make up. Until the day Lily doesn't come home from school. Abducted and held captive for eight years, Lily finally manages to escape her kidnapper and return home. Only she's not the same. She has a six-year-old daughter named Sky now; she also has scars and memories no young woman should have. But she's home with her mother. And with Abby.... Only they're not the same either. 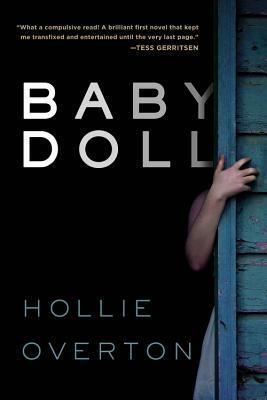 Hollie Overton's Baby Doll has a lot of similarities to Emma Donoghue's Room, but the twin connection between Lily and Abby puts a unique spin on an otherwise familiar premise. The narration alternates between Lily, Abby, their mother, and Lily's abductor, but I actually didn't mind the alternating view points. In fact, the shorter chapters help keep the story moving at a pretty fast pace. Lily was my favorite character, and the majority of this book is her story. But how her abduction affected her twin sister adds an interesting layer. Some of Overton's choices at the end bugged me a little bit, but not enough to ruin the rest of the book. 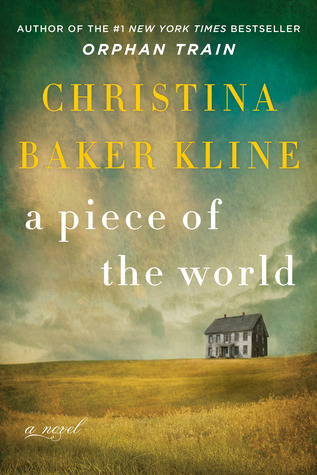 Overall, I enjoyed this psychological suspense novel; it's compelling without being dark or graphic, and it focuses on the characters and their efforts to keep moving forward with their lives rather than on what Lily endured at the hands of her captor, which I appreciated. I hope Overton writes many more. and as vital to our lives as water and good bread." 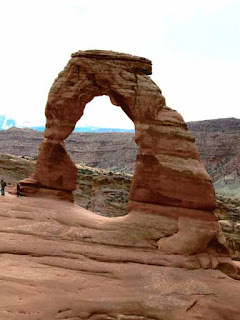 I was only about six years old the first time I visited Arches National Park in southeastern Utah. After far too many years away I finally went back last week with my sisters. And despite the cool temperatures and even colder wind, this place was even more amazing than I remembered. 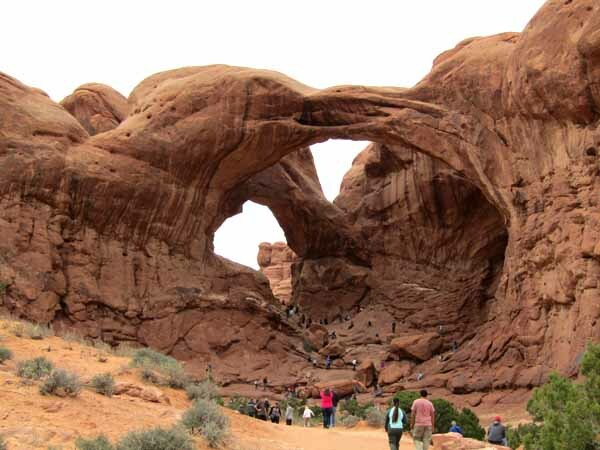 Here are some of my favorite sights from my short spring break trip to one of the prettiest national parks in the United States. fragile bridges to the sky. 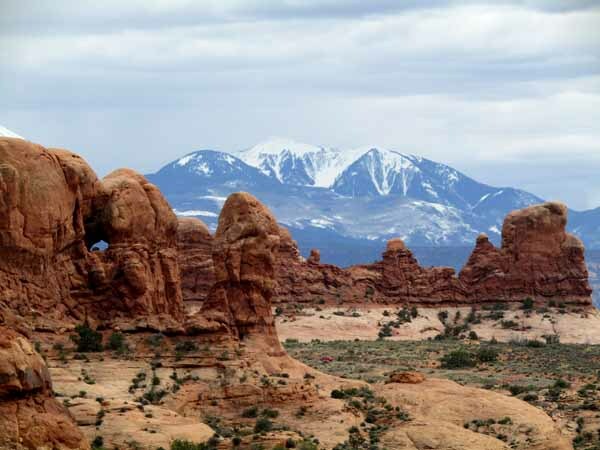 "Men come and go, cities rise and fall, whole civilizations appear and disappear (but) the earth remains ... and the heartbreaking beauty where there are no hearts to break. 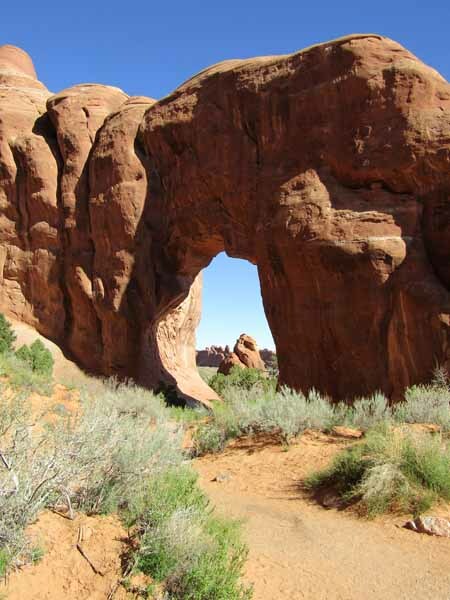 I sometimes choose to think that man is a dream, thought an illusion, and only rock is real. Rock and sun." 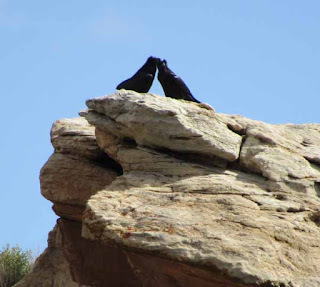 trespassers in their world of sun and rock and sky. I loved them. Arthur Prescott, who loves books and all things King Arthur, teaches English at the University of Barchester, but he is happiest in the Barchester Cathedral Library with its ancient books and manuscripts. 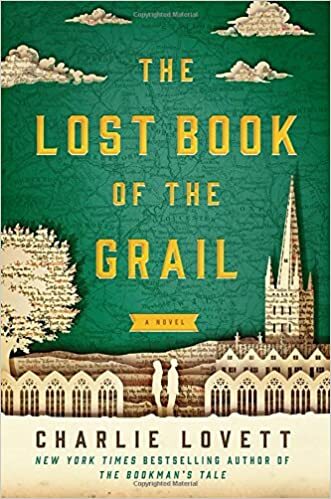 He hopes to solve the mystery of Saint Ewolda, and maybe find the Holy Grail, too, which he believes is hidden somewhere in the Barchester Cathedral. 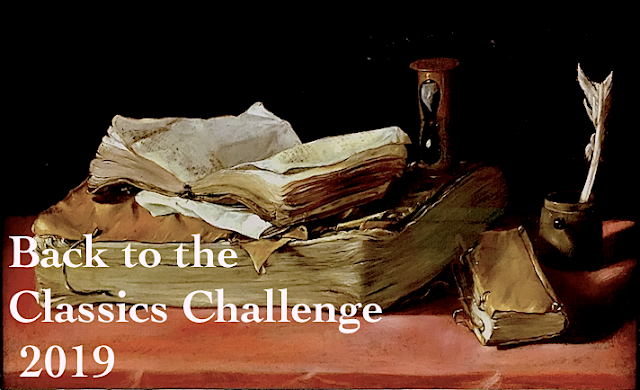 Then Bethany Davis, a younger American woman, shows up at Barchester in order to digitize the library's manuscripts and turns Arthur's world upside down. Together they embark on a quest to find the lost Book of Ewolda, decipher the secrets it contains, and hopefully follow it to the Grail. Charlie Lovett skillfully weaves together the present and the past in this engaging literary mystery. And he sets it all in Anthony Trollope's Barchester, which makes it even better. I love the way Lovett writes. 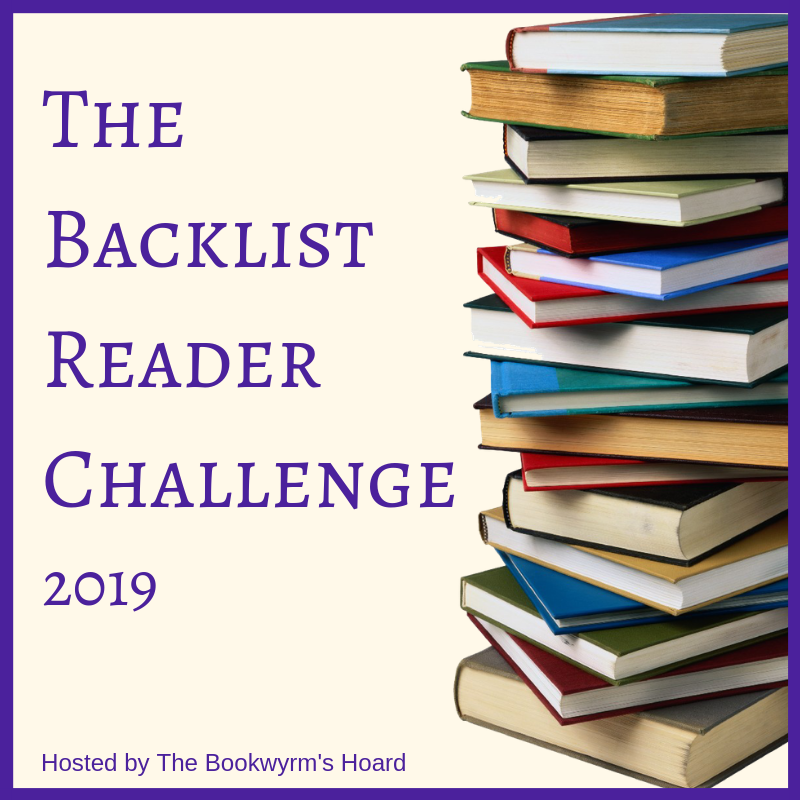 And I really liked Arthur and Bethany--the sparks between them, their disagreements and witty banter, and the way they worked together to unlock the secrets of Barchester Cathedral. And though it never upstages the mystery, I liked their romance, too. The Lost Book of the Grail is a very enjoyable read....though I think I still like Lovett's previous books just a little bit better. But that's only because they are ALL so good. to the one that looks away. reminded me of your smile.